Well, I started making bacon last night. I separated out 5 lbs. of pork belly to cure. I have 2 packages that are about 2.5lbs. each in the fridge curing. I am already excited to taste the final product. 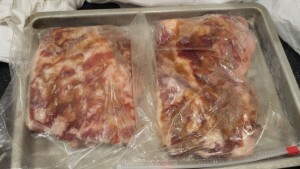 I did some reading and compiled the information that I found into one recipe and process for making my own bacon. I went with a brown sugar and salt cure mix with some additions. The working part of the cure is the salt. Salt removes moisture and prevents spoiling. Sugar is added for flavor and to smooth out the roughness of the salt. Other spices and flavorings can be added to suit your individual taste. I added some of my favorite pork spices like garlic, pepper, cloves, and some liquid smoke. It is important to measure out the correct amount of Curing Salt #1 for the weight of the pork. Curing salt ( Pink Salt) is used to retain the red meat color and to prevent botulism. There are recipes that do not include pink salt, but to obtain the true flavor for bacon it is needed. I decided to add the curing salt to my mix last. I mixed all the ingredients in one bowl for the entire batch of pork. And of course, I tasted the mix to get a feel for what the flavors would be. (One of the reasons to add the Pink salt last, don’t taste test after the pink salt is added.) I then weighed the separate portions of meat that went into each seal-able bag and figured the amount of Cure #1 for each bag. I separated out the amount of mix I wanted in each bag and then mixed in the curing salt at that time. This way my flavor profile for the mix was consistent, and I knew that the correct amount of Cure #1 was added to each portion of meat. 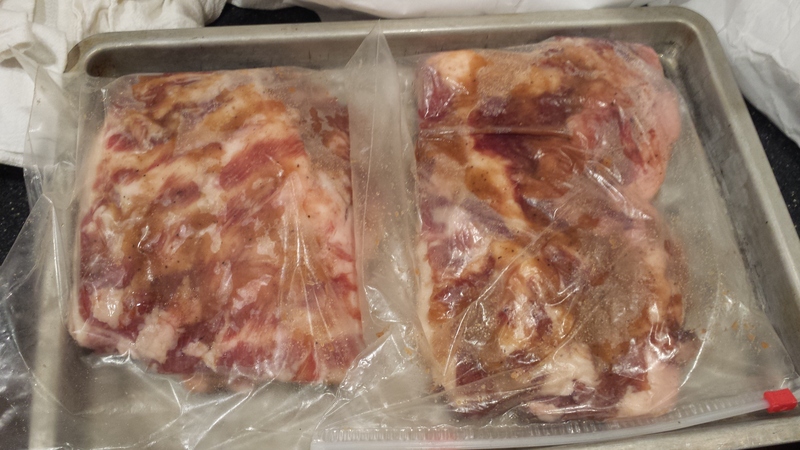 I rubbed down the pork belies with the cure mix while they were sealed in the bag. the cure mix will draw out the moisture from the meat and infuse some of the flavor from the spices. A brine will form in the bag over the next few days. I will turn the bags over each day and rub the mixture into the meat. As the meat cures and the moisture is removed the meat will shrink slightly and start to firm up a bit. Before the weekend, I will check the meat and see if it is uniformly firmed up, or if some areas feel like they need more salt. I can always add a little more salt (not pink salt) to draw out more moisture, or I can allow a bit more time for the process to complete. Once the curing is complete my next step will be to rinse off the cure. I will then work on getting our bacon smoked. I can’t wait until next weekend when I fire up the smoker. I will let you know how t goes.